How much is a new FIAT 500X? The 2018 FIAT 500X starts at $19,995 for the entry-level 500X Pop and $22,285 for the top-tier 500X Lounge. This makes the 500X a more affordable option than the 500L. No matter your choice, you’ll enjoy a wide variety of features for the money. Read on to explore the new FIAT 500X prices, trims, and features that will assist you when you’re traveling from Tacoma to Seattle or vice versa. Pop — includes a 1.4L MultiAir® Turbo Engine, a ParkView® Rear Back Up Camera, Uconnect® 4, a 7-inch touchscreen, and Apple CarPlay and Android Auto compatibility. Trekking — includes a 2.4L Tigershark® MultiAir® 2 engine, 17-inch aluminum alloy wheels, fog lamps, deep-tinted sunscreen glass, and automatic headlamps. Urbana — includes Copper exterior accents, black roof rails, 18-inch two-tone wheels with Copper center caps, and Black Castiglio fabric seats. Lounge — includes heated fronts, a heated steering wheel, Uconnect® 4 NAV, an 8-speaker premium audio system, and 17-inch aluminum wheels in Silver. Blue Sky — includes a unique Blue instrument panel, Blue Patterned cloth seats, satin chrome exterior accents, and 17-inch aluminum wheels with Matte Black accents. Learn More About the FIAT 500X Price Near Lakewood! Make the trip from University Place to FIAT of Tacoma to test drive one of the FIAT 500X trim levels! Still have questions about FIAT SUV prices? Contact us online to learn more! Be sure to check out our new vehicle specials for possible savings opportunities on this versatile family vehicle! Curious about where FIAT is made? Learn about the brand’s Italian history and more with us – you might be surprised by what you find out! What Can Fit Inside a 2018 FIAT 500? 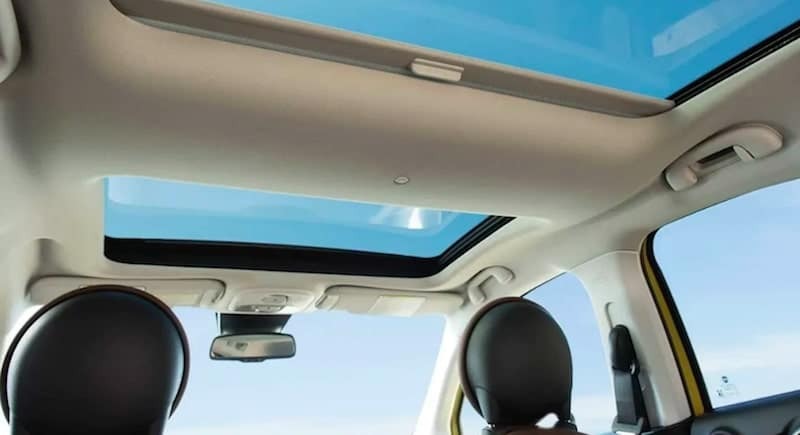 What Can Fit On Top a 2018 FIAT 500? How Much is a 2018 FIAT 500? What’s the MPG of the 2018 FIAT 500? 0 comment(s) so far on What is the 2018 FIAT 500X Price?